The exhibit will be on view to the public, September 5th – September 20th. An Arizona transplant with an educational background in animation and graphic design, MDMN has gone from gritty posters on the streets to doing exceptionally clean acrylic and aerosol work in a matter of just a few years. Inspired by a 90’s childhood filled with bright action figures, creepy extra-terrestrial villains, and armies of robots that can be seen on every piece of his work, MDMN exhibits a youthful fantasy that reminds fans of Saturday cartoons. Encouraged and influenced by his family’s love for art of all kinds has driven MDMN to release his passion through bright colors and dreamlike characters. 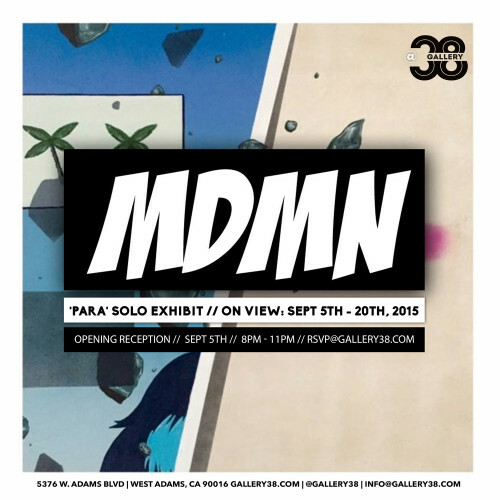 Even though the MDMN brand has just begun, he already has toys, gallery work, and countless large-scale murals. Sometimes people lose imagination and dreams through the disheveled paths heaved at us, but through MDMNs artwork you can at least lose yourself for a moment in a beaming fantasy world of luminescence and adventure. MDMN’s first solo exhibition titled ‘PARA’ alludes to both ‘paradise’ and ‘pairs’. 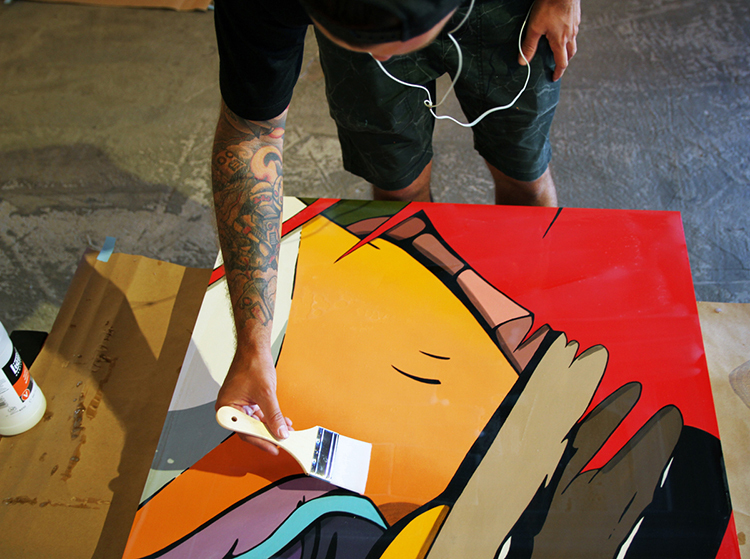 This title embodies mindset and artistic style, which began when he moved to Los Angeles. This struggle in “paradise”, experienced by countless artists, told in pairs of artwork depicting heroes and villains. MDMN will debut Mr. McClaim & Cpt. Fats, art toys that will be available in 8 color ways to mirror the 8 Los Angeles murals he has completed this year. Each will be one of one and will never be duplicated. He declares “My only villains are toys”, and even his most villainous are simply awkward super heroes trying to find their way and their power. Focusing on contributing to neighborhoods nationwide (and eventually worldwide) with large animated insight into his world of illustration of super heroes, his artwork will inspire and encourage creativity from every community he touches, just like your favorite superhero.